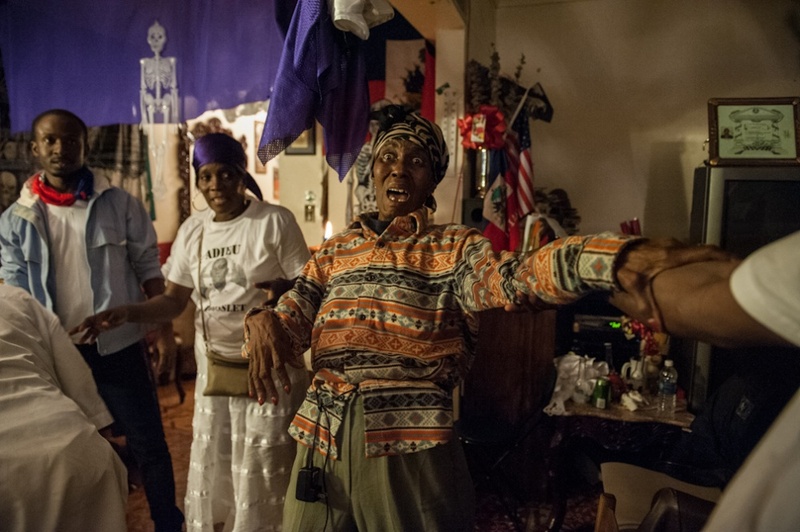 Vodou practitioners call a Spirit during a Haitian Vodou ceremony celebrated in the apartment of a Mambo (Vodou priestess) in Brooklyn, NY on November 23, 2013. November is the busiest month of the Vodou religious calendar when one of the most important Haitian Spirits named Gede, the Spirit of Death and Resurrection, is feted. 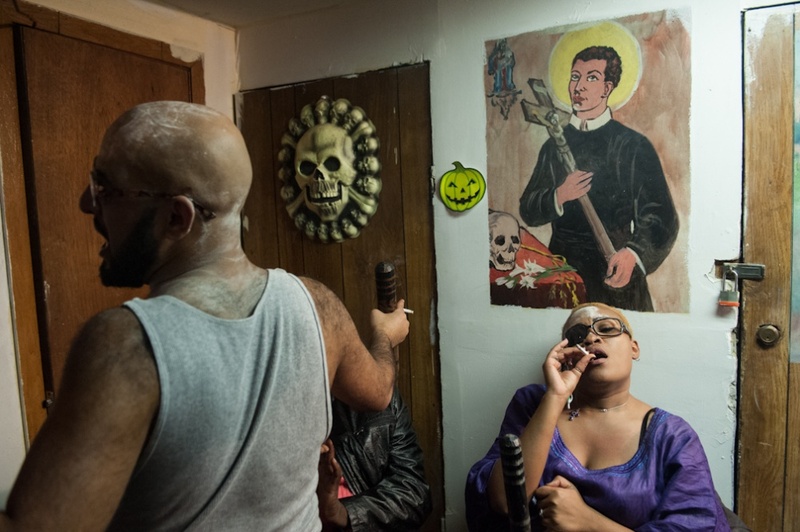 A Vodou priest is possessed by the Spirit Gede during a ceremony celebrated in the apartment of a Mambo (Vodou priestess) in Brooklyn, NY on November 23, 2013. November is the busiest month of the Vodou religious calendar when one of the most important Haitian Spirits named Gede, the Spirit of Death and Resurrection, is feted. Vodou practitioners sing songs to the Spirits during a Haitian Vodou ceremony celebrated in the basement rented by a Mambo (Vodou priestess) named Patricia in East Flatbush, Brooklyn, NY on November 16, 2013. November is the busiest month of the Vodou religious calendar when one of the most important Haitian Spirits named Gede, the Spirit of Death and Resurrection, is feted. 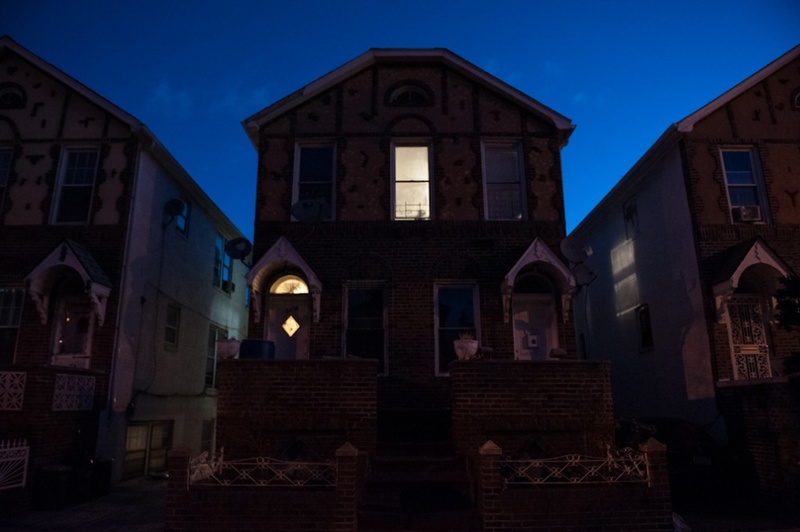 A Vodou ceremony for the Spirit Gede is celebrated in this second floor apartment even as the sun begins to dawn in East Flatbush, Brooklyn, NY on November 23, 2013. November is the busiest month of the Vodou religious calendar when one of the most important Haitian Spirits named Gede, the Spirit of Death and Resurrection, is feted. 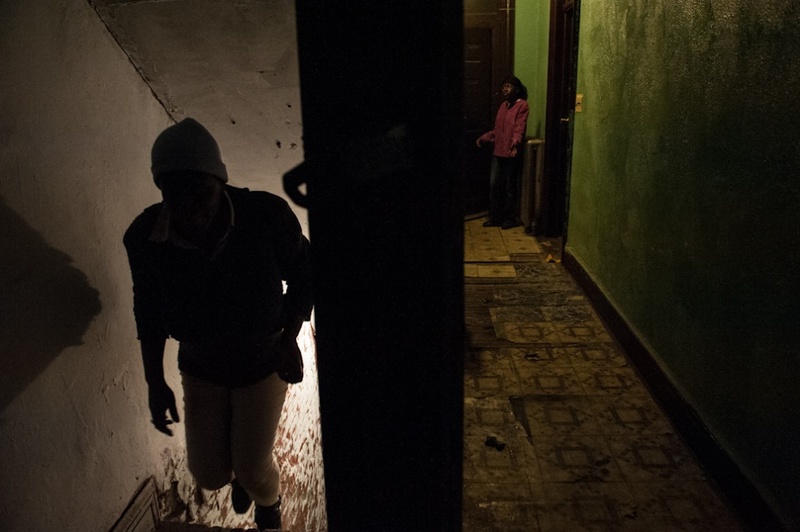 The entrance to the basement where a Haitian Vodou ceremony is celebrated in East Flatbush, Brooklyn, NY on November 16, 2013. November is the busiest month of the Vodou religious calendar when one of the most important Haitian Spirits named Gede, the Spirit of Death and Resurrection, is feted. Two Vodou practitioners start the ceremony by lighting candles and singing special songs for the Spirits during a Haitian Vodou ceremony celebrated in a basement in Brooklyn, NY on November 9, 2013. A Vodou priest dons a shroud in preparation for being possessed by the King of the Gede Spirits, Baron La Croix, during a Haitian Vodou ceremony celebrated in a basement in Brooklyn, NY on November 9, 2013. Gede is a family of Spirits representing Death and Resurrection. 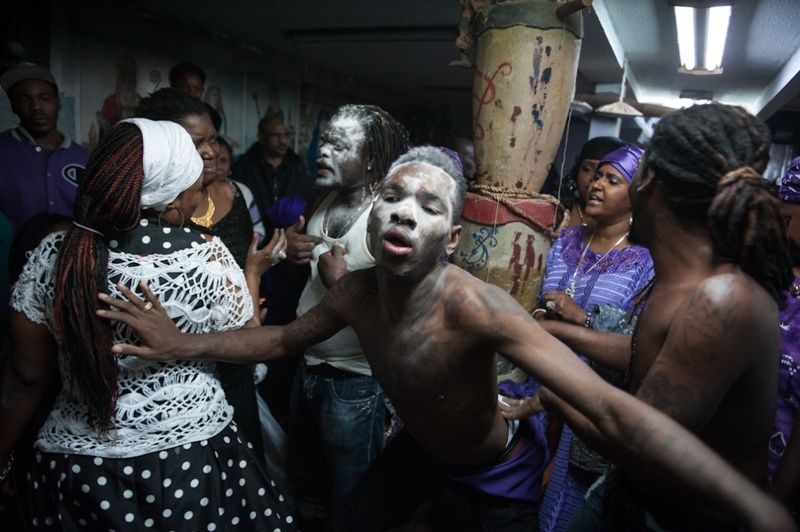 Several Vodou practitioners are possessed by the Spirit Gede near the end of a Haitian Vodou ceremony celebrated in a basement in Brooklyn, NY on November 9, 2013. Gede is a family of Spirits representing Death and Resurrection. Gede covers his face in talcum powder to approximate the pallor of death. 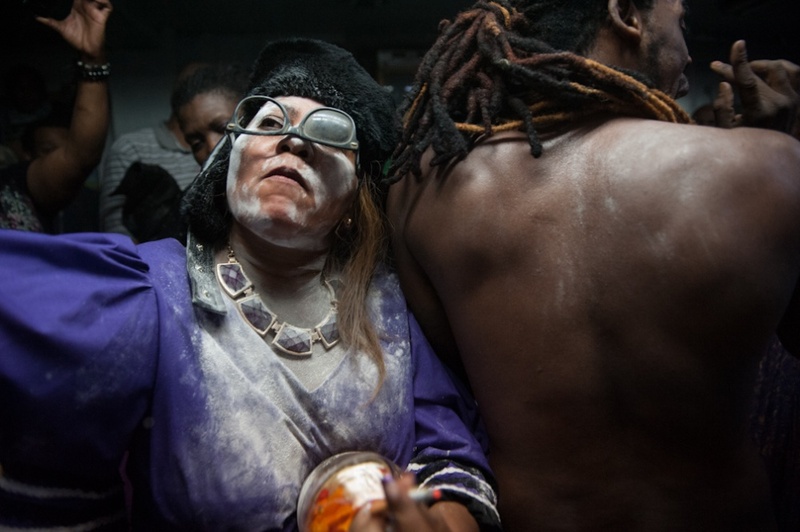 Several Vodou practitioners are possessed by the Spirit Gede near the end of a Haitian Vodou ceremony celebrated in a basement in Brooklyn, NY on November 9, 2013. Gede is a family of Spirits representing Death and Resurrection. Gede covers his face in talcum powder to approximate the pallor of death and has a raucous, sexual energy. 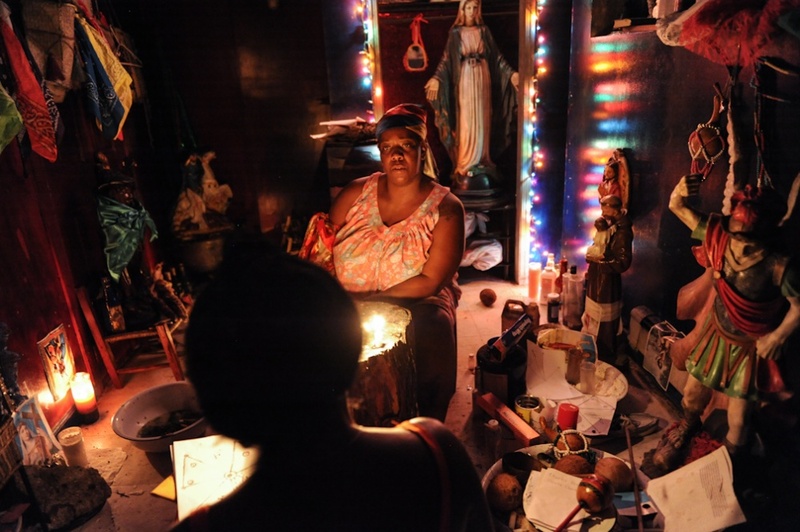 A Vodou priestess is possessed by the Spirit Gede during a Haitian Vodou ceremony celebrated in a basement rented by a Mambo (Vodou priestess) named Patricia in East Flatbush, Brooklyn, NY on November 16, 2013. 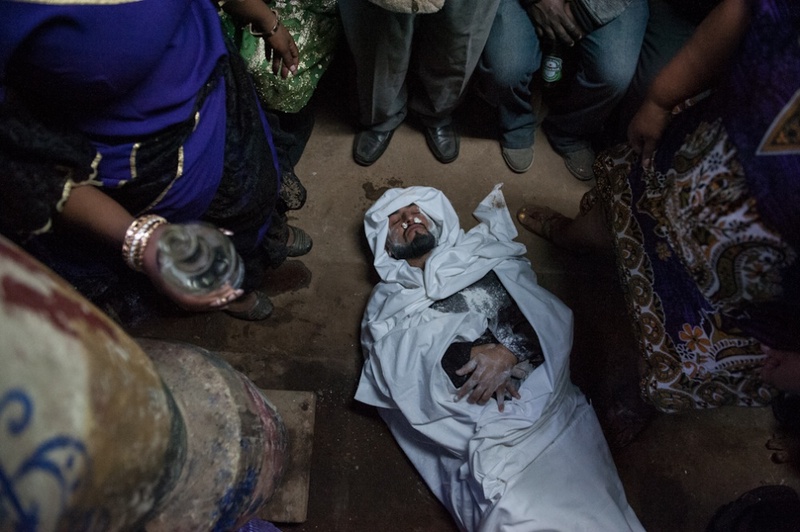 Gede, the Spirit of Death and Resurrection, covers his face in talcum powder to approximate the pallor of death. 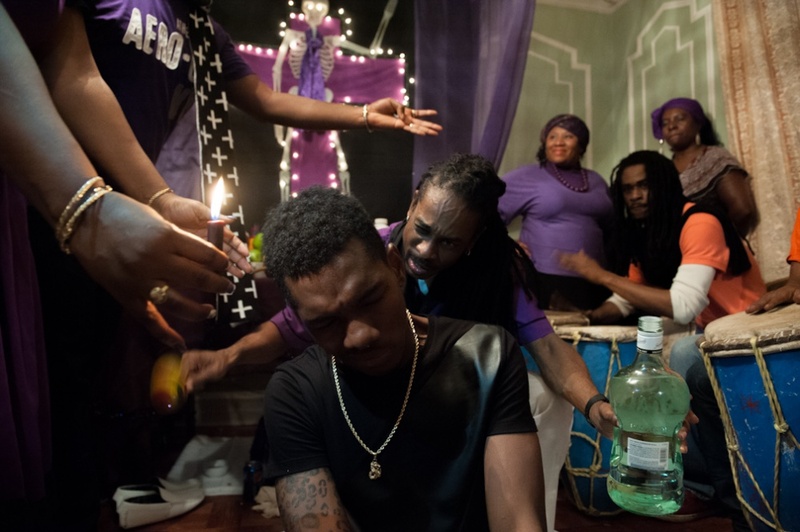 A Vodou priest is possessed by the Spirit Gede during a ceremony celebrated in the apartment of a Mambo (Vodou priestess) in Brooklyn, NY on November 23, 2013. Gede, who is the Spirit of Death and Resurrection, covers his face in talcum powder to approximate the pallor of death. 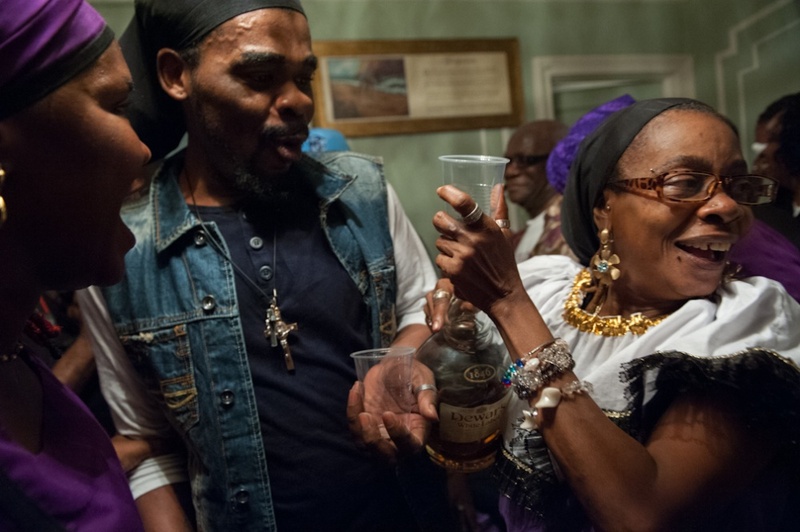 Libations are passed out during a ceremony celebrated in the apartment of a Mambo (Vodou priestess) in Brooklyn, NY on November 23, 2013. November is the busiest month of the Vodou religious calendar when one of the most important Haitian Spirits named Gede, the Spirit of Death and Resurrection, is feted. 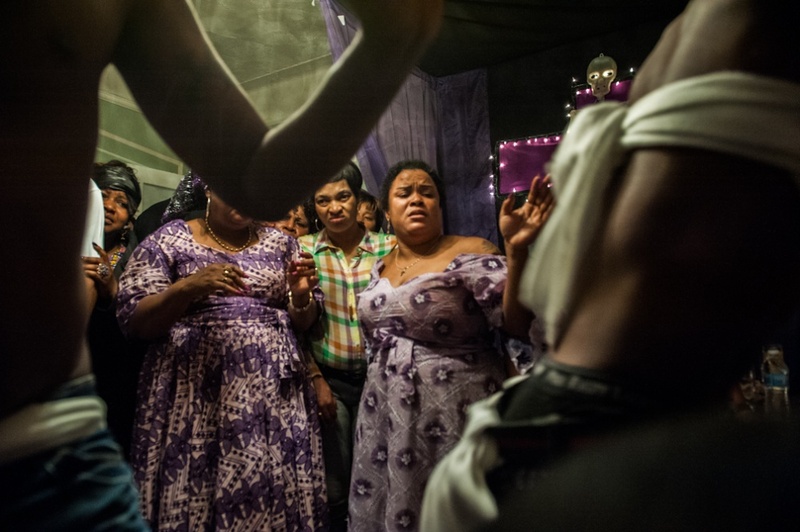 Audience members react to a possession by the Spirit Gede during a ceremony celebrated in the apartment of a Mambo (Vodou priestess) in Brooklyn, NY on November 23, 2013. Gede, the Spirit of Death and Resurrection, has a raucous, sexual energy. 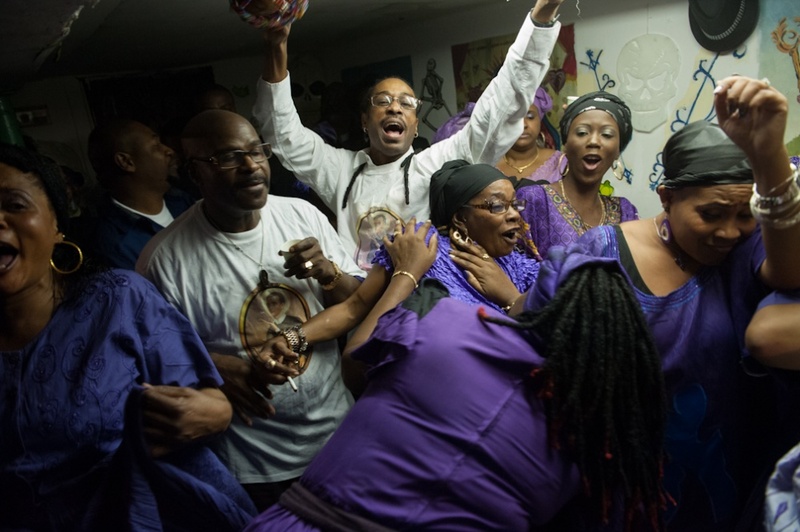 Audience members react to a possession by the Spirit Gede during a ceremony celebrated in the apartment of a Mambo (Vodou priestess) in Brooklyn, NY on November 23, 2013. November is the busiest month of the Vodou religious calendar when one of the most important Haitian Spirits named Gede, the Spirit of Death and Resurrection, is feted. 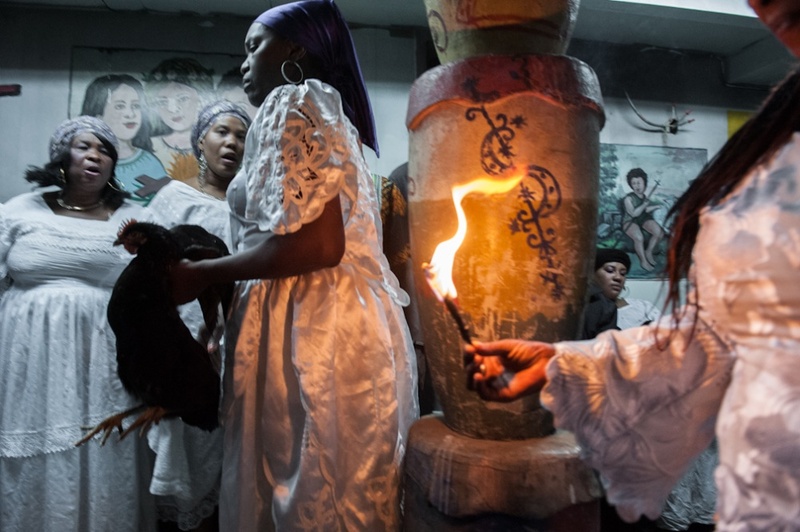 A two day Haitian Vodou ceremony is celebrated in the basement of a well know Mambo (Vodou priestess) named Edlyene in Brooklyn, NY on November 8, 2013. During the ceremony other Spirits are called. Here, a Spirit named Ogou, the warrior spirit, blesses an audience member by blowing smoke and pouring rum onto her head. 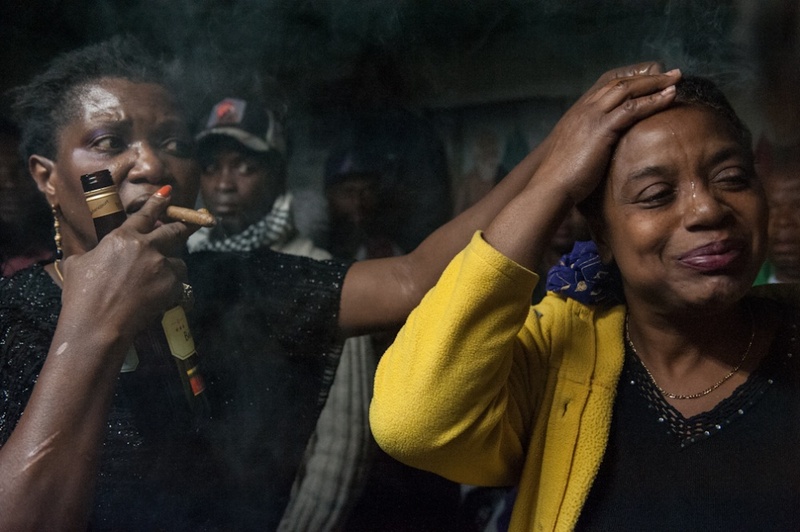 Two Vodou practitioners are possessed by the Spirit Gede at the same time during a Haitian Vodou ceremony a basement in East Flatbush, Brooklyn, NY on November 16, 2013. On the wall is the Catholic representation of the Spirit Gede, St. Gerard. Mambo Marie Carmel hosts a small Vodou ceremony for the Spirit Ezili Dantor in a private apartment in Brooklyn, NY on December 20, 2012. People believe that if you fete a Spirit then that Spirit will help you with practical matters in your life. 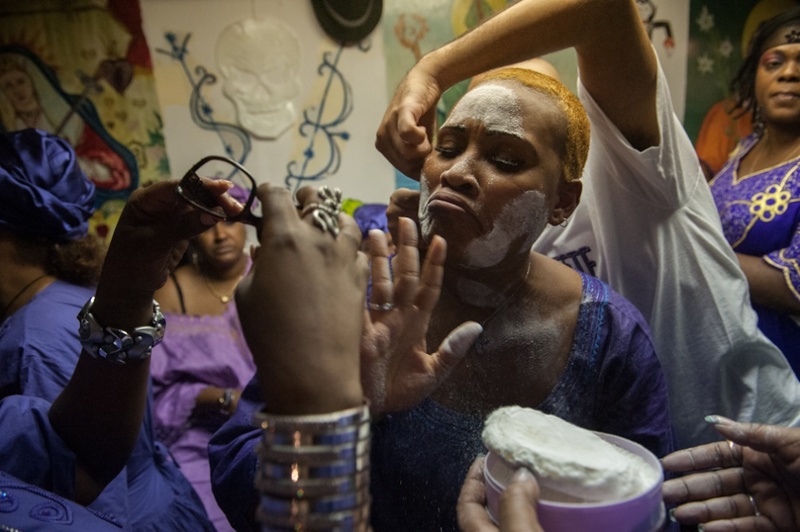 Mambo Marie Carmel administers to a large client base by performing individual Vodou ceremonies to help solve their life problems from her Spirit room in her apartment in Brooklyn, NY on August 19, 2013. 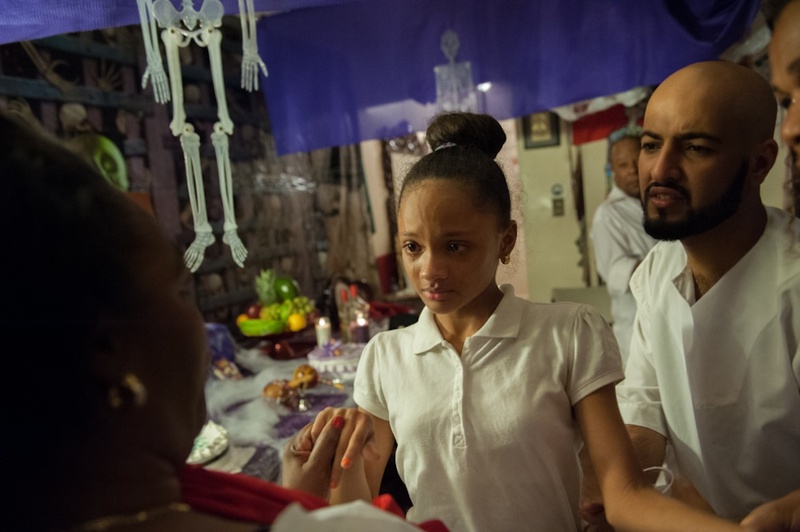 The daughter of a Vodou Mambo is called to become initiated by her Mother who is possessed by the Spirit Ogou during a Vodou ceremony in a private apartment in Brooklyn, NY on November 2, 2013. 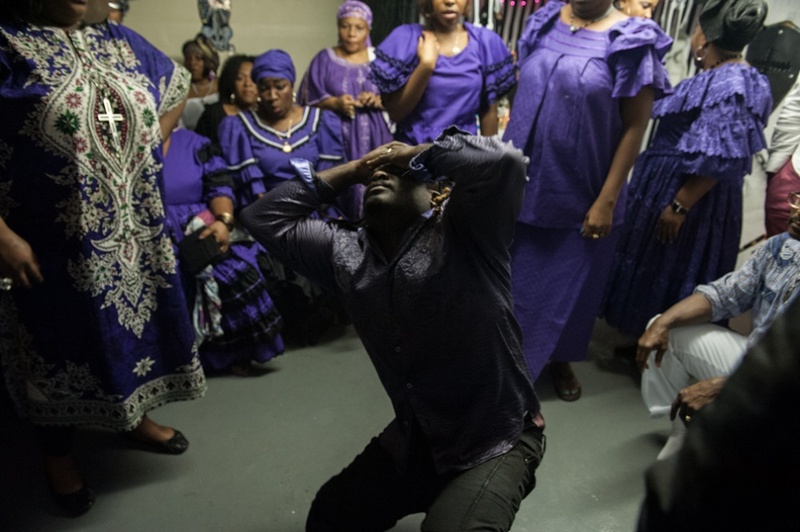 A woman accidentally "catches" a Vodou Spirit during a Vodou ceremony to honor the Spirit called Gede in a private apartment in Brooklyn, NY on November 2, 2013. 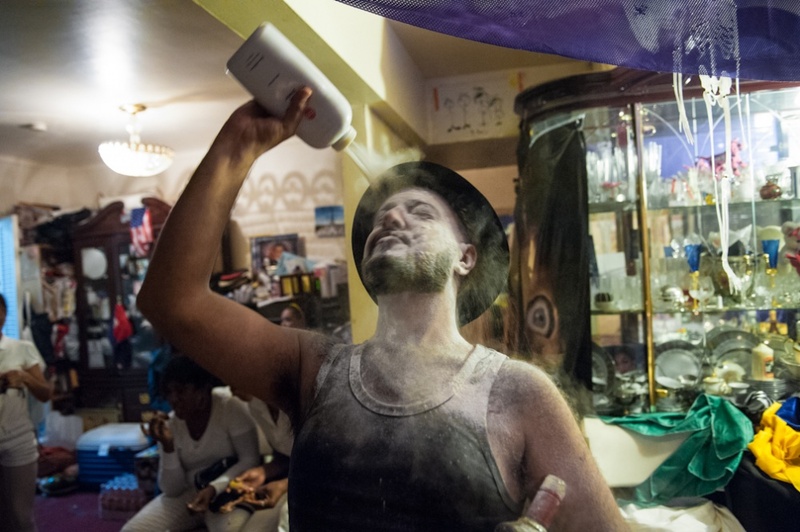 A Vodou priest pours talcum powder on his face while possessed by the Spirit Gede during a Vodou ceremony to honor the Spirit called Gede in a private apartment in Brooklyn, NY on November 2, 2013. Vodou practitioners ready a chicken for sacrifice to the Spirit Gede during a two day Haitian Vodou ceremony celebrated in the basement of a well know Mambo (Vodou priestess) named Edlyene in Brooklyn, NY from November 8, 2013. 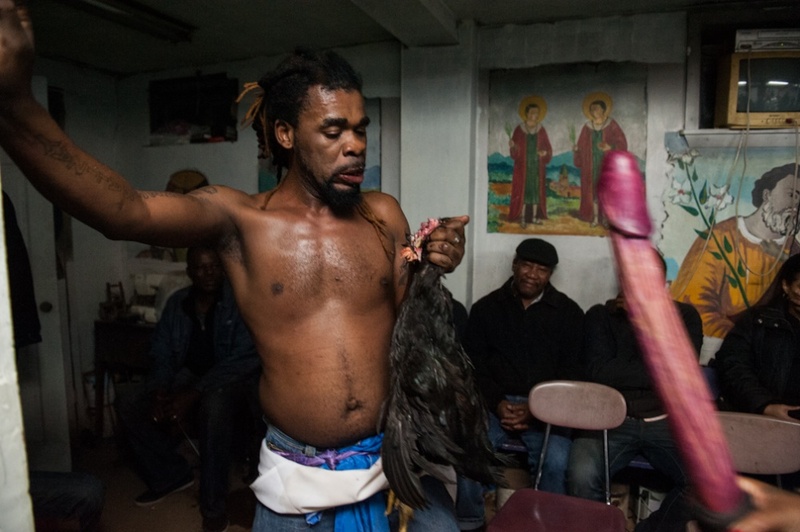 A Hougan (Vodou priest), while possessed as the Spirit Gede, kills a chicken by biting into its neck during two day Haitian Vodou ceremony celebrated in a basement in Brooklyn, NY on November 8, 2013. 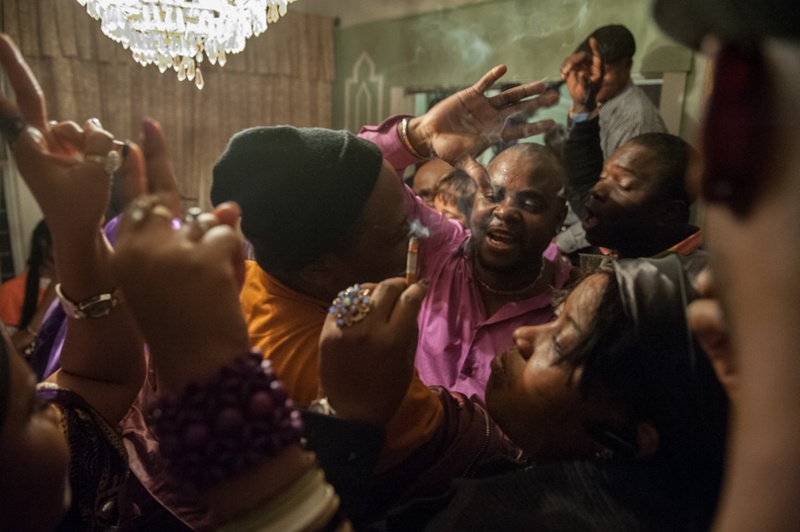 A Vodou priest begins to feel the effects of possession during a Vodou ceremony in a basement in Brooklyn, NY on December 7, 2013. 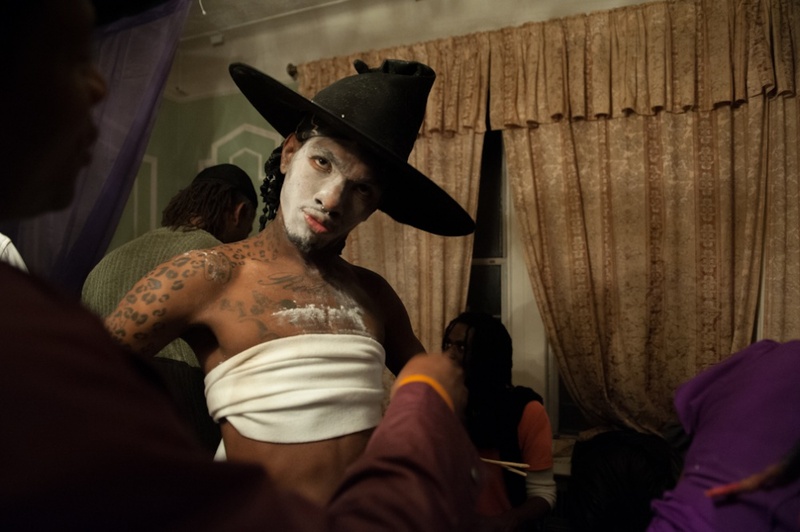 A Vodou priestess is possessed by the warrior Spirit Ogou during a Vodou ceremony to honor the Spirit called Gede in a private apartment in Brooklyn, NY on November 2, 2013. Ogou's symbol is the machete as he historically is seen as a liberator of Haiti. Ogou is an exacting taskmaster often telling people to become initiated. 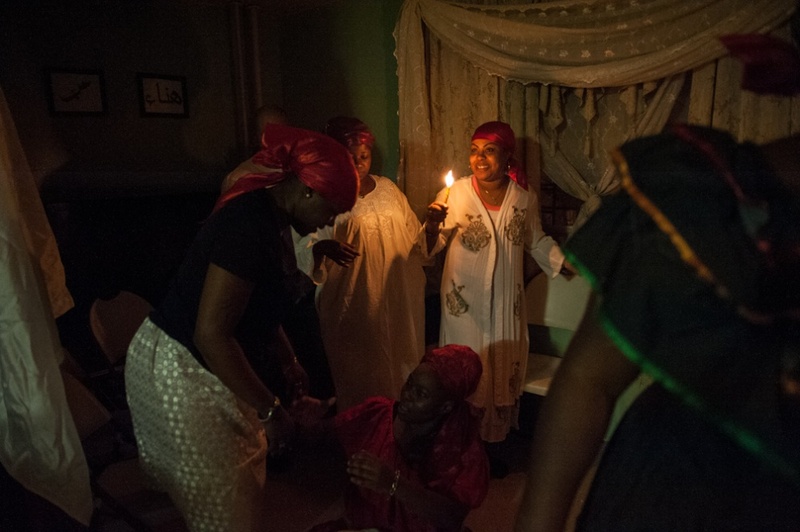 Vodou practitioners sing special songs to the Spirit Gede during a ceremony celebrated in the apartment of a Mambo (Vodou priestess) in Brooklyn, NY on November 23, 2013. November is the busiest month of the Vodou religious calendar when one of the most important Haitian Spirits named Gede, who is the Spirit of Death and Resurrection, is feted. 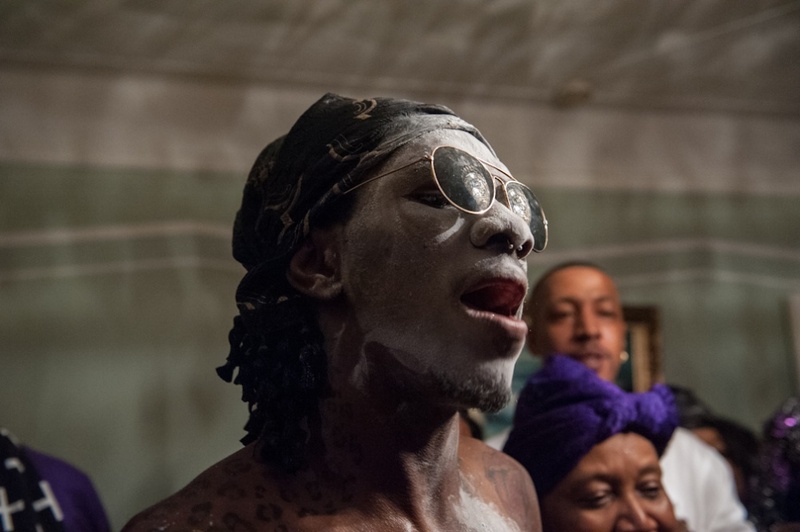 A Vodou priest sings a special song to the Spirit Gede to encourage Gede to possess this man during a ceremony celebrated in an apartment in Brooklyn, NY on November 23, 2013. November is the busiest month of the Vodou religious calendar when one of the most important Haitian Spirits named Gede, the Spirit of Death and Resurrection, is feted. 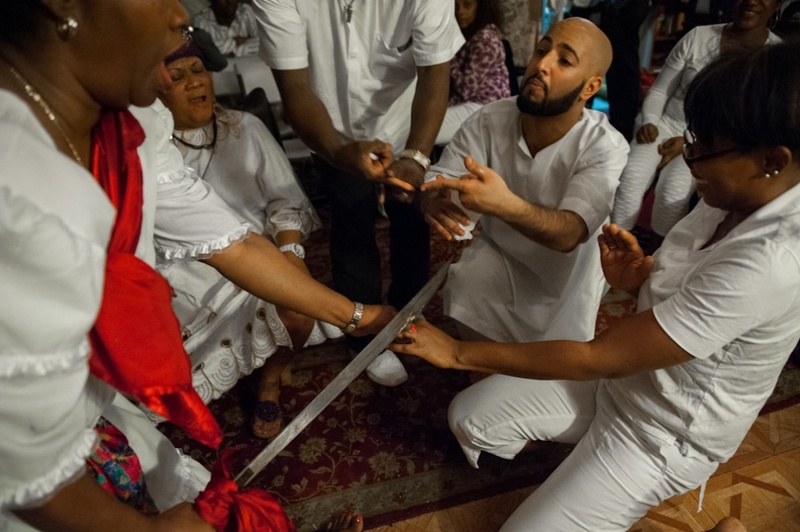 In a five-month period, from August 2013 through December 2013, I attended thirteen different Vodou ceremonies with every major “house” of Vodou in Brooklyn, following Vodou religious leaders to private apartments and basements across the borough. I was initially attracted to Vodou because it seemed so unknowable, so misunderstood. 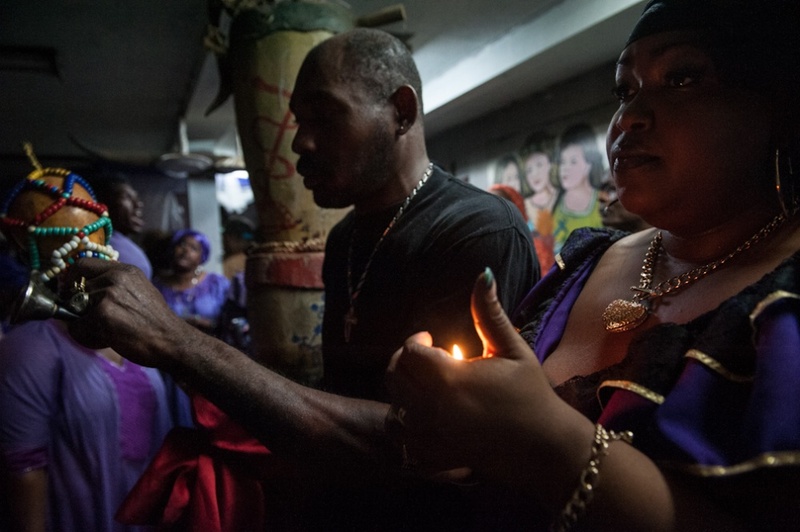 How many times have I heard that Vodou is the Devil’s work? 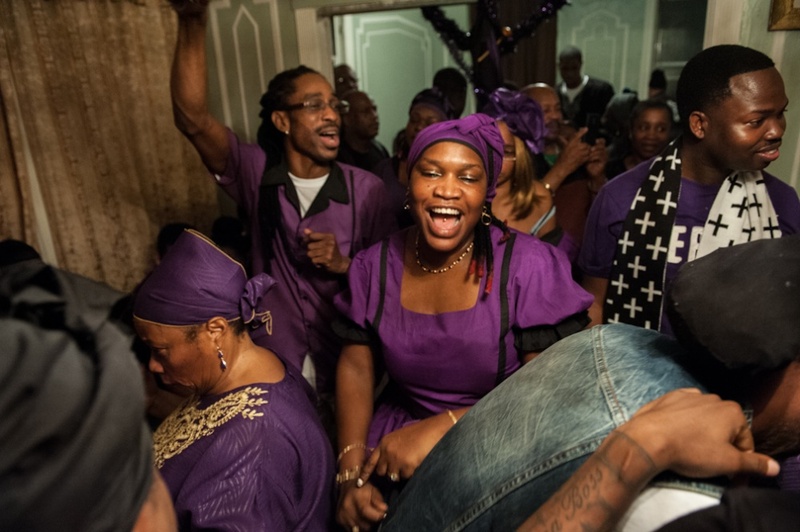 What I found was a large group of people connected through their faith, deriving great strength from Vodou and having a great time doing it. 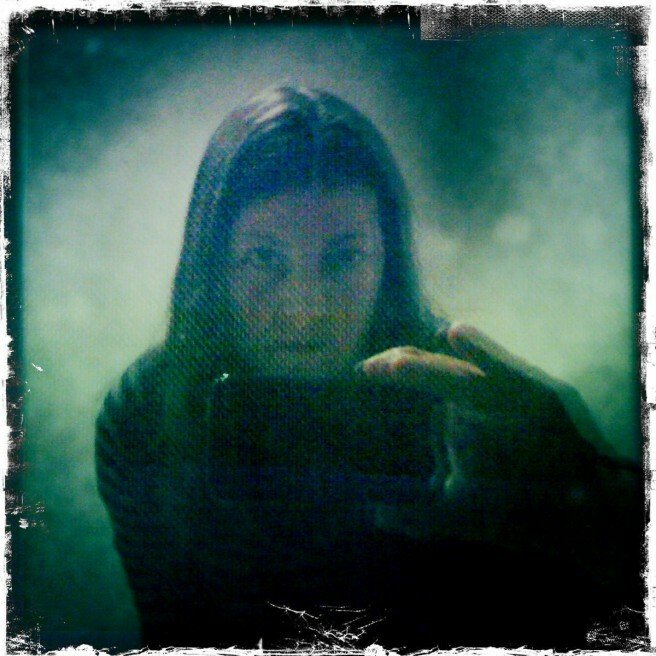 The idea is to interact with the Spirits in a direct, personal way and spiritual possession is the key. 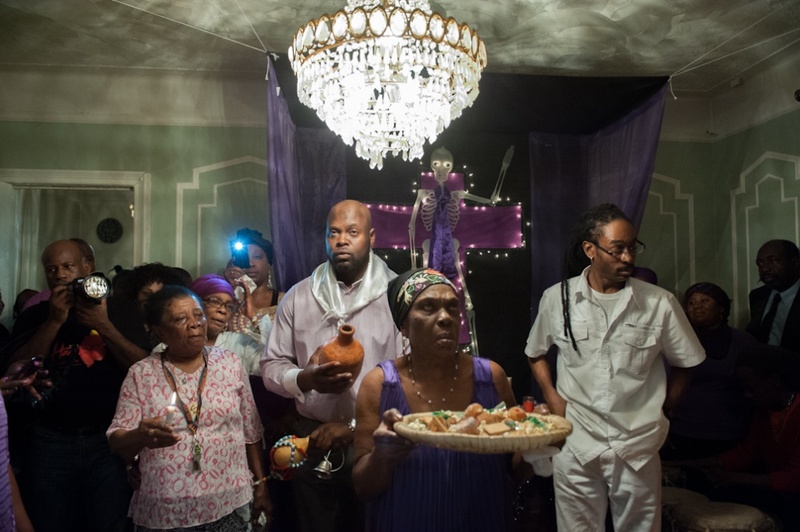 Vodou is a sustaining dialogue with a complex pantheon of Spirits both Haitian and African. It provides a focal point to reliving and redefining the history of the Haitian people. By Stephanie Keith — With the construction of the Dakota Access pipeline (DAPL), the time of the Sioux prophecy foretelling the arrival of a black snake that would..
By Stephanie Keith — Ever since I did an extensive story about Haitian Vodou in Brooklyn, I've always wanted to travel to another country in the Americas to take a look..